This weekly market includes 32 vendors selling local produce, meat, dairy, baked goods, herbs, flowers, and pastas. It’s open on Saturdays from May through November. This weekly indie arts market includes a variety of local artists and artisans and their products. Available merchandise varies weekly. The market is open on Saturdays from May through November. This festival celebrates Virginia’s seafaring past. Dress up as a pirate for the costume contest, and experience the life of a sailor with activity stations, music, and private boat tours. The event is recommended for kids age 4 and up. Admission is $10, and boat rides are $2. Preregistration is required for the boat rides. Reston Association greets springtime with this annual celebration. Acoustic music, live animals, fishing, crafts, native plant sales, and environmental information will all be available. Then head to Lake Audubon for canoe and kayak rentals. The festival is FREE, and boat rentals are $3. Dozens of pet rescue groups will have adoptable pets. Live entertainment, a pet fashion show, pet contests, vendors, and a charity walk for homeless animals are some of the highlights of this festival. Bring your dog and maybe even adopt a new member of your family. FREE. If you’ve been wanting to check out the relatively new Mosaic District, here’s your chance to sample food from various restaurants there. They’ll also have a beer garden, live entertainment, pony rides, and children’s activities. FREE. An evening of chocolate and charity will benefit the protection of African elephants. Several desserts will be available, and guests are invited to bid on a large variety of silent auction items. Tickets $40 per person. This popular 4-mile charity walk raises money to help more moms have full-term pregnancies and healthy babies. Register online or at the event at 9am. 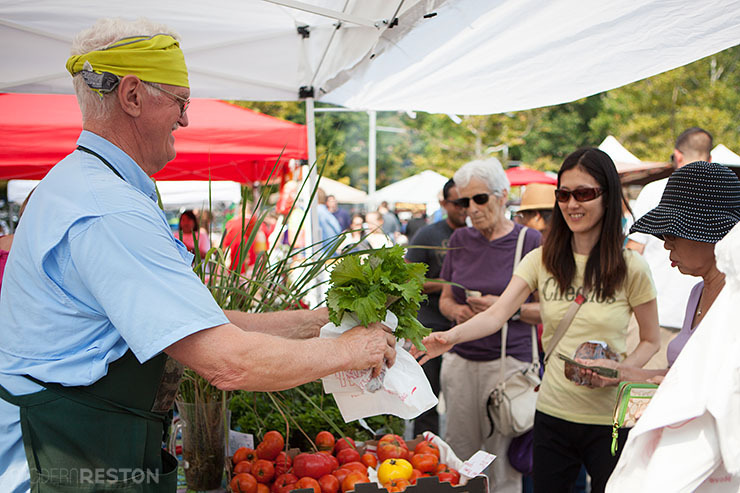 This year Reston’s Wednesday farmers market has moved to the new Plaza at Reston Station, making it a Metro-friendly option for fresh, local produce and meats. Fifteen local vendors offer a variety of products at this weekly market. It’s open May through November each year. Here’s an opportunity for children and their parents to see Herndon’s big trucks and heavy equipment on display. Light refreshments will be served and souvenirs will be provided to children. FREE. As part of the DC-area’s Bike to Work Day, the Plaza at Reston Station is hosting an official pit stop, where registered attendees can receive free t-shirts and chances to win bicycles and other prizes. FREE. Celebrate the opening night of the annual Fine Arts Festival at a private party with the festival artists. Enjoy hors d’oeuvres, a silent auction, and live entertainment. Tickets are $75 each. This annual event is a Modern Reston favorite! This nationally top-ranked fine art and craft festival typically attracts 30,000+ patrons, and raises money for the Greater Reston Arts Center. View and purchase creations by talented artists from around the country. 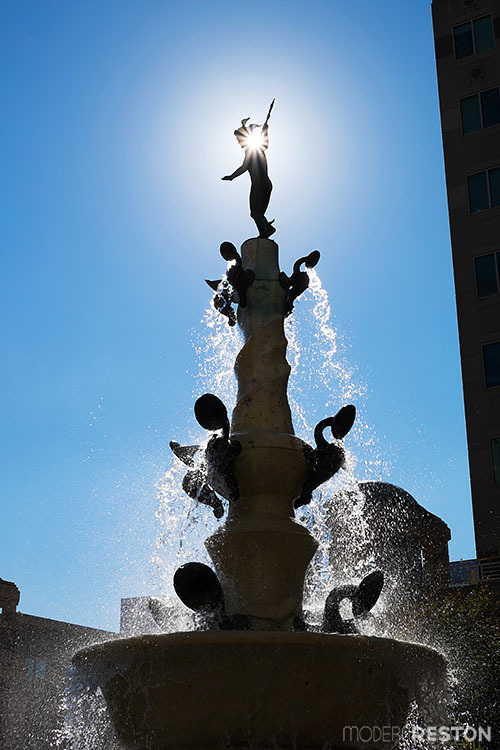 Meet artists, enjoy dance performances, and explore hands-on art activities for kids. See the new stick sculpture by Patrick Dougherty. $5 donation suggested for admission. 95 families will be selling items; arrive early to score some great deals. Vendors must pre-register with payment to secure space. Teams will walk around the track throughout the day and night to raise money for the American Cancer Society. In honor of Water Safety Month, Goldfish Swim School is hosting its first annual Safety Day, with safety vehicles, demonstration of water safety skills, and snacks. The pool will be open for swimming. FREE and open to the public. A new local theater company presents its first production, an abridged version of Shakespeare’s Hamlet. FREE. Most of the RA pools open on Memorial Day weekend for the summer season. You can find a list of the pools and their hours here. Purchase your pool/tennis passes at the RA headquarters or online. 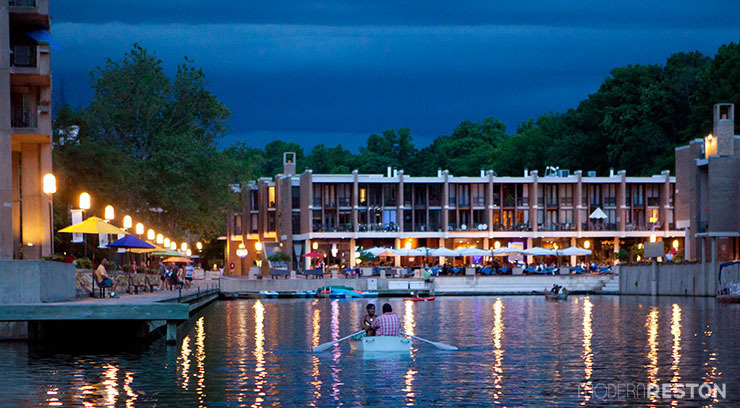 Explore Lake Anne with a kayak, canoe, rowboat, or pedal boat. Rentals are available Thursdays through Sundays until Labor Day weekend. Tickets can be purchased at the Reston Used Book Shop for $6 per hour. Reston’s water park has over an acre of slides, sprays, floatables, and interactive play features. Admission $11.25-$14.50. Season passes are available. Take part in a sing-along of patriotic music, to salute America’s troops. The Reston Chorale will collect donated items to send to servicemen and women to boost their morale while deployed. See the list of recommended donations here. Concert is FREE. Learn the swimming techniques of Chloe Sutton and Larsen Jensen, two of the best open water and distance freestylers in the world. This annual Memorial Day celebration offers carnival rides, food, crafts, artists, local history, and live music. Admission is FREE. “The President’s Own” United States Marine Band will launch Wolf Trap National Park for the Performing Arts’ summer season with a program of concert band favorites. A fireworks display will follow the concert. FREE. The Jim McDonnell Lake Swims are hosted each year on Memorial Day weekend, in honor of Reston Masters’ Swim Team team member Jim McDonnell, who died of non-Hodgkins Lymphoma. Two races are be held: a 1-mile swim and a 2-mile swim. Festivities include a 3K Fun Run, amusement rides, live entertainment, and a lively parade down Park Avenue. A Veteran’s Ceremony will begin at 11am outside the Community Center. Admission is FREE. A film will be presented on “The Mobil Years – Reston in the 1980’s.” It will be followed by a discussion among panelists who were instrumental in Reston’s development during the Gulf Years. Herndon greets the summertime each year with this four-day carnival and concert series. Live music, rides, games, kids activities, fireworks, and 10K/5K races are among the featured activities. Lake Anne’s new specialty pet store and adoption facility is holding its grand opening celebration with dock diving dogs entertaining the crowds. There will also be face painting, cooking demos, and opportunities for your dog to try dock diving. FREE.